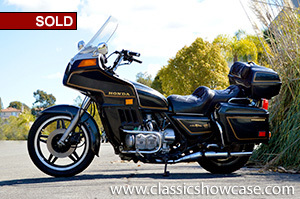 (SOLD) This 1981 Honda Gold Wing is a strong survivor that is full of classic 80s styling, and loaded with patina. It has received a new battery, and has undergone a recent full servicing by Honda professionals. The bike has numerous desirable options, including a JVC stereo system, saddlebags, and a removable trunk, which makes this bike an excellent choice for touring. The seats, padding, instrumentation, and accessories on the bike all fare well, and mechanically the Gold Wing's motor remains strong, standing in fine running condition. With continuing growth and appreciation of the classic motorcycle market, this early 80s Honda example would provide the new collector or classic bike restorer/enthusiast with an excellent starting point. The Honda Gold Wing is a series of touring motorcycles manufactured by Honda. It was introduced at the Cologne Motorcycle Show in October 1974, and went on to become a popular model in North America, Western Europe and Australia, as well as Japan. Total sales are more than 640,000 "Wings," most of them in the U.S. market. The Society of Automotive Engineers of Japan includes a Honda Gold Wing GL1000 manufactured in 1974 as one of their 240 Landmarks of Japanese Automotive Technology. Through 2012, Honda GL models have appeared eighteen times in the Cycle World list of Ten Best bikes. Over the course of its history, it has had numerous changes to its design and production. In 1975 it had a 999 cc (61.0 cu in) flat-four engine and in 2001 it had a 1,832 cc (111.8 cu in) flat-six. Gold Wings were manufactured in Marysville, Ohio from 1980 until 2010, when motorcycle production there was halted. Honda went beyond the mechanical makeover of the naked Gold Wing in March 1980 by releasing the first Japanese turn-key tourer, the Interstate model (GL1100I) with a factory-installed full fairing, saddlebags and a removable trunk, plus a long list of optional extras including a stereo system. This bike was called the De Luxe model (GL1100DX) in some markets. The fairing was designed to protect both the rider and a passenger from the wind. Likewise, the saddlebags and trunk were intended to carry the baggage of two people.